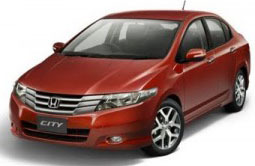 Honda City Hire Bangalore ,The Honda City 'Exclusive' with advanced and dynamic styling is an owners delight it offers a distinctive combination of refined styling and high quality. The leather seats, leather steering and leather gear shift knob (only in MT) enhances the feeling of luxury and elegance of the car. Adding to the stylish and trendy look of the car is a Chrome trunk garnish and Chrome door sash moulding along with an 'Exclusive' rear badge that enhances the ownership experience of the Honda City 'Exclusive'. Drive to Discover was a blend of adventure, thrill and excitement as the participants experienced India in its glory and colours from the lush country side to its vibrant cities. During the drive they traversed through high altitude mountainous terrains, beaches, flat highways, congested city roads and experienced the interiors of India. Drive to discover is a relay drive conceptualised and organised by Honda Siel Cars India. with participation from 8 leading automobile magazines and 3 auto shows.